The above prices are in Euro, per room and per night, inclusive of continental breakfast, VAT and service charges. Reservation fee per room and per stay: € 20,00 (VAT 19,6% included). 15th July 2009: After this date, reservations are not guaranteed. Companies wishing to reserve an allotment of rooms at a certain hotel should contact the local Organizing Secretariat of Publi-Créations in Monte-Carlo. Please indicate arrival and departure dates on the Accommodation Form. Should booking dates not be indicated, arrival on Sunday, 30th August and departure on Friday, 4th September, 2009 will be assumed. The rooms booked will be available to the participants from the first night of the reservation. In case of no-show the hotel will not refund the deposit and reservation will be automatically cancelled. Hotel check-in time is 15.00 and check-out time is 11.00 a.m.
• By Internet: an “online” Accommodation Form with payment by credit card in a very secure mode is available. • By Bank Transfer: please transfer the payment to Publi Créations S.A.M. The payment transfer should be net of charges to our Company and it should clearly state the “XVI World Meeting of UIP”. • By Bank Check: checks to be made in Euro to PUBLI CREATIONS S.A.M. and sent by post, together with the Hotel Accommodation Form to PUBLI CREATIONS - Partner of AIM, 74, Bd. d’Italie, 98000 Monte-Carlo (Monaco). • By Credit Card: all major credit cards are accepted. Please enter the credit card number and expiration date in the appropriate space on the Hotel Accommodation Form. The following cancellation policy is applicable to the Individual Hotel reservations. • Cancellations made before 30th May, 2009: the payment will be refunded after the Congress and after deduction of an administrative fee of € 60. • Cancellations made before 15th June, 2009: one night fee will be kept. A refund of the difference will be made after the Congress. • Cancellations made after 15th June, 2009: no refund. As an integral part of an audaciously built seven story building complex, right by the sea, the Fairmont Monte Carlo Hotel enhances its splendid entrance hall with an immense picture window, which allows guests to cast their eyes directly into the Mediterranean Sea. The Fairmont Monte Carlo Hotel is situated only a few minutes walk away from the Grimaldi Forum and the town center shops and services. Le Meridien Beach Plaza Hotel has unequalled views over the sparkling, azure Mediterranean Sea and boasts its own sun-soaked private beach. It has a freshwater indoor swimming pool, two seawater pools and a fitness centre. Its gardens are delightful as are the seaside terraces. The Méridien Beach Plaza Hotel is both very close to the center of town and on the seafront. More than a new hotel, more than a new resort, this is a new concept to discover in Monaco. Four hectares of gardens and luxury on the water's edge, 334 rooms, a spa, restaurants, casinos, shows, and a night club, the Monte Carlo Bay resort & hotel is an authentic prestigeous club nested on a dream-like island, renewing the spirit of the legend and splendor of the 30s, chic and light, luxurious and relaxed. Directions: Nice : by car – highway exit Monaco or by the Basse Corniche. Belle-Epoque, romantic, timeless, the Hermitage hotel has all the charm of those sites unaffected by the passage of time. Emotions are aroused in the contours of a mural, and pursued under the glass roof of the Winter Garden. After several months of embellishment and renovation works, the hotel Hermitage is from now on a member of the “Leading Hotels of the World”. The hotel Hermitage is in the very heart of Monte-Carlo, a stone’s throw from the Casino, Café de Paris and the bustling activity of the shops and restaurants in this very busy area. The Port Palace has opened in September 2003. Situated in the centre of the Monaco Harbour, only a few yards away from the Casino, this brand-new elegant palace enjoys an exceptional location with unrestricted views over the Rock of Monaco. Location: 200 metres away from the train station. A few exceptional luxury hotels one day cease to be an address and become a legend. The Hôtel de Paris Monaco is one of them. Built in 1864 with the ambition to offer the best of an era, the Hôtel de Paris continues to symbolize this same excellence in the art of hospitality. Enchantingly situated on the Golden Square of the Place du Casino of Monte Carlo. The Hôtel de Paris is heir to the spirit of the grand hotels. Casting a serene reflection upon the Cap d'Ail harbor on France's Cote d'Azur, the Riviera Marriott La Porte de Monaco captures the spirit of Monaco. It's a magical place, where you can lose yourself in its fragrant breezes, profound beauty and international allure. As one of the premier hotels in Monaco, you'll be introduced to a superior level of service and amenities. Elegantly appointed guest rooms beautifully blend extraordinary comfort with welcome features such as high-speed Internet access. In the Brasserie & Bar "Le Cap", our chef indulges the senses with Provencal specialties, exquisitely prepared international dishes and a lavish Sunday Champagne brunch. To look and feel your best, a fitness center offers state-of-the-art equipment as well as a pool for a sunny retreat. The luxury alternative to the traditional Monte-Carlo hotels, the Columbus Monaco combines accessibility, affordability, style and elegance. This supremely chic Riviera hotel, was designed by Amanda Rosa who was the recipient of the Andrew Martin International Designer 2001 award. She successfully combined noble materials such as wood, leather, linnen, marble, slate and stone with tones such as chocolate, coffee, caramel and cream. The 181 rooms which include 28 suites and junior suites, reflect elegance while delighting your eyes with both the Princess Grace Rose Garden and the magical grand view of the Mediterranean Sea. 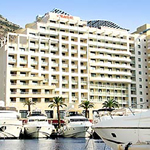 In the Fontvieille area of Monaco, a 6 minute helicopter ride or a 30 minute car ride from the Nice Airport, the Columbus Monaco is located in the Princess Grace Rose Garden. A 3 star hotel with 218 new generation rooms, located in the heart of Monte Carlo, only a few steps from the SNCF railway station, the Place Du Casino and the Forum Grimaldi. The Novotel Monte Carlo offers 530 sqm of modular meeting spaces, a landscapedterrace for cocktail functions, a bar and a restaurant opening out onto a vast terrace area with a pool and gardens. The Hotel Alexandra, with a certain charm dating back to the turn of the century, has been completely restored. It is provided with 56 rooms of the utmost comfort. Situated in the heart of Monte-Carlo, only two steps from the Casino and the parking places, the beaches are a ten minute walk away. Offering utmost comfort and friendly service, this property is an ideal place for an unforgettable stay.